For those familiar with Big Data and Hadoop (otherwise see my article here), I feel Map/Reduce has a pretty high onramp to entry. Part of what is difficult and not easily explained is how to decompose your business problems into solutions that can run as a series of Map/Reduce jobs. So what better way to learn this than to explore a particular problem. Now, for those of you that are not big fans of reading Academic papers bear with me for a minute. Pantel, Philpot and Hovy published a really great paper for the IEEE Journal in December 2005 called Data Alignment and Integration. In this paper they explained how Information Theory can be used to flag suspicious calls in the interests of Homeland/National Security. They put forth an algorithm that makes use of PointWise Mutual Information which shows how this can be done. So let me first explain their approach and then we can take a look at how to implement it in Map/Reduce. "Pointwise mutual information is high when x and y occur together more often than they would by chance, which is computed by the probability of x and y occurring independently." OK. Thats all the Math we need to get into. I swear. So now, if we the use source phone number as one event and the number being called as the second event, this starts to get interesting! Lets assume the following data points for us to plug into our algorithm. This data comes from the original article, which used Bogota, so if you're from Colombia, this isn't intended to offend. When a PMI result (7.88) for a user's calls to a particular city is higher than the average (or a particular threshold) the user gets flagged. The original article goes into way more detail explaining PMI and Information Theory. I encourage you to obtain it. But the focus of this post is to help you understand how to put this into Map/Reduce so I need to move on. If you want to use Map/Reduce and you don't work for Google, then you need to be using Apache Hadoop. Hadoop is perfect for this type of a problem as you're dealing with Huge Datasets of Log Files (specifically Call Log Files), something that Hadoop is really, really good for. In addition, Hadoop is designed to run on commodity hardware so this allows mission critical compute intensive solutions such as the one we're exploring to be run on affordable and widely available hardware. I'm going to have to run a number of jobs to first be able to determine all of these variables for each city that a user has called before I can finally run a job computing the PMI result. This actually results in 5 separate sequential Hadoop Jobs that I need to run. This is a pretty standard pattern when working with Hadoop. Each Subsequent Job builds on the job that ran before it. In some cases, the key is the originator in other cases the Originator and City are a joint key. Either way, the values are continually being augmented as we progress through the jobs continually building up the variables we need. The example output being displayed for the results of each job below is an example of one record in the output and not the entire output itself. This job assumes the input schema of your call records looks like the following (taken from Vonage) and has been copied onto a directory on the hdfs called "calls". M/R Function: Split the Originator as the Key and the City and Total_Calls_To_City_By_Originator as the Values. No Reducer. Map: RecordRead in the results from Job 3, Parse them out and make the City the Key and rest of the information for the record, the Values. Reduce: Iterate over the values for each Key(City) to determine total Calls for that City. 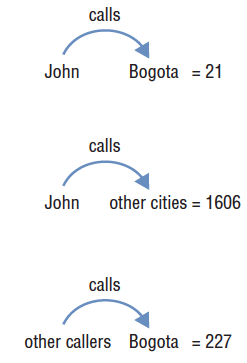 For each value record, subtract the originators calls to that city from the total to determine Total_Calls_To_City_By_Others. Write out the Originator as the Key and and augment the value tuple with the information for Total_Calls_To_City_By_Others. M/R Function: Now that you have all the variables, calculate the PMI Rank for Each City an Originator has called. Reduce: The Key received by the Reducer is the Originator. Each Value in the Values Array contains all the information needed calculate the PMI Rank for the originators calls to that City. Calculate the PMI Rank. Write out the Originator as the Key and City and PMI Rank as the Value.